The ability to create clean, safe drinking water using only natural levels of sunlight and inexpensive gel technology could be at hand, thanks to an innovation in water purification. According to the United Nations, 30,000 people die each week from the consumption and use of unsanitary water. Although the vast majority of these fatalities occur in developing nations, the U.S. is no stranger to unanticipated water shortages, especially after hurricanes, tropical storms and other natural disasters that can disrupt supplies without warning. Led by Guihua Yu, associate professor of materials science and mechanical engineering at The University of Texas at Austin, a research team in UT Austin’s Cockrell School of Engineering has developed a cost-effective and compact technology using combined gel-polymer hybrid materials. Possessing both hydrophilic (attraction to water) qualities and semiconducting (solar-adsorbing) properties, these “hydrogels” (networks of polymer chains known for their high water absorbency) enable the production of clean, safe drinking water from any source, whether it’s from the oceans or contaminated supplies. The findings were published in the most recent issue of the journal Nature Nanotechnology. “We have essentially rewritten the entire approach to conventional solar water evaporation,” Yu said. 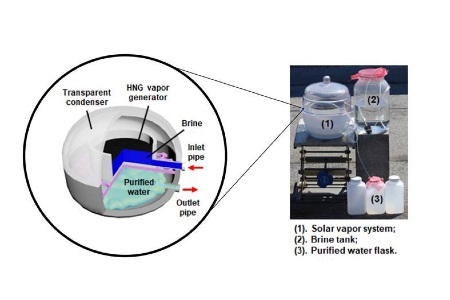 The Texas Engineering researchers have developed a new hydrogel-based solar vapor generator that uses ambient solar energy to power the evaporation of water for effective desalination. Existing solar steaming technologies used to treat saltwater involve a very costly process that relies on optical instruments to concentrate sunlight. The UT Austin team developed nanostructured gels that require far less energy, only needing naturally occurring levels of ambient sunlight to run while also being capable of significantly increasing the volume of water that can be evaporated. The hydrogels allow for water vapor to be generated under direct sunlight and then pumped to a condenser for freshwater delivery. The desalinating properties of these hydrogels were even tested on water samples from the salt-rich Dead Sea and passed with flying colors. Using water samples from one of the saltiest bodies of water on Earth, UT engineers were able to reduce salinity from Dead Sea samples significantly after putting them through the hydrogel process. In fact, they achieved levels that met accepted drinking water standards as outlined by the World Health Organization and the U.S. Environmental Protection Agency. Because salt is one of the most difficult substances to separate from water, researchers have also successfully demonstrated the hydrogels’ capacity for filtering out a number of other common contaminants found in water that are considered unsafe for consumption. Yu believes the technology can be commercialized and is preparing his research team in anticipation of requests from industry to conduct scalability tests. The potential impact of this technology could be far-reaching, as global demand for fresh, clean water outpaces existing natural supplies. A patent application has been filed, and Yu has teamed up with the university’s Office of Technology Commercialization to assist with the licensing and commercialization for this novel class of hydrogels. This research was funded by the Alfred P. Sloan Foundation, the Camille & Henry Dreyfus Foundation and the National Science Foundation.